Quash Pre-Wash Lipstick Remover is the essential system for perfect drinks presentation. Lipstick on glassware leaves a lasting impression, not to mention the drain on your profits through replaced drinks. With the Quash lipstick remover system you can eliminate these worries for good. The Quash® System is a pre-wash removal for grease marks and lipstick from the lip area of all types of glassware, which typically appear on glassware within a busy beverage service area in restaurants, bars, pubs and clubs. Its safe, non-hazardous, simple and hygienic to use. The solution is suitable for all types and shapes of glass, and is best used on wine and cocktail glasses, restoring them to an immaculate standard of presentation in preparation for the next service. Simply twist the upturned glass in a solution filled foam pad and the glass is ready for washing in the normal way. The foam pad also comes with its own applicator tray, which sits neatly next to the wash up area for simple and convenient integration into the normal washing procedures. Quash lipstick remover should be used as part of your daily maintenance along with your regular glass washing practice, which can then reduce the frequency of the need to renovate glassware. 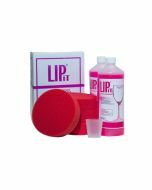 This lipstick remover starter pack includes 1x 500ml Quash concentrate, 1 x foam pad (should be replaced after every 500ml of concentrate), 1 x Quash applicator and 1 measuring jug. Refill packs are available that include replacement pad and Quash concentrate.